Jessica Alba recently celebrates her birthday. 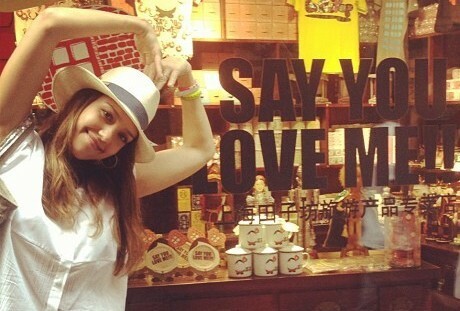 Jessica Alba shares her holiday snaps in Shanghai with her fans online. Jessica Alba treats her kids and Cash Warren to weekend partying. Jessica Alba and Sofia Vergara went to Cinco de Mayo on May 5 in New York City. Jessica Simpson looked casually chic while visiting her acting coach on January 17 in Los Angeles. Jessica Alba is the host for a cocktail event at ABC Kitchen to celebrate the launch of her new company Honest . com . Jessica Alba and her daughter Honor were spotted while stopping by at Starbucks in Beverly Hills yesterday. Jessica Alba and Cash Warren treated their daughter Honor to the fair in Pomona, California on Saturday. FBI is reportedly investigating Jessica Alba’s leaked photos, which showed the actress showed off her breasts. Jessica Alba dished details on her kids and how she lost baby weight at 2011 ALMA Awards. Jessica Alba and husband Cash Warren welcomed baby daughter yesterday. Jessica Alba went to Washington DC for Safe Chemicals Act press conference on May 24.